Chronic atherosclerotic arterial disease of the lower limb have a progressive evolution up to final clinical stages when rest pain and trophic lesions are dominant. 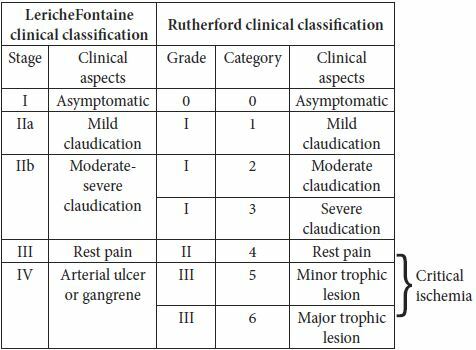 These are stages 3 and 4 in Leriche-Fontaine classification, also known as critical ischemia, when the affected limb is threatened (Table 1). The treatment of election in these stages of disease is the interventional treatment (endovascular, surgical and/or hybrid procedures). In our department’s experience on this type of pathology, bypass is the dominant procedure of arterial lower limb revascularization. In terms of anatomoclinical classification the peripheral obstructive arterial disease of the lower limb takes two forms: aortoiliac arterial obstructive disease (affecting abdominal aorta and iliac arteries), and infrainguinal obstructive disease (affecting arteries below the inguinal ligament). 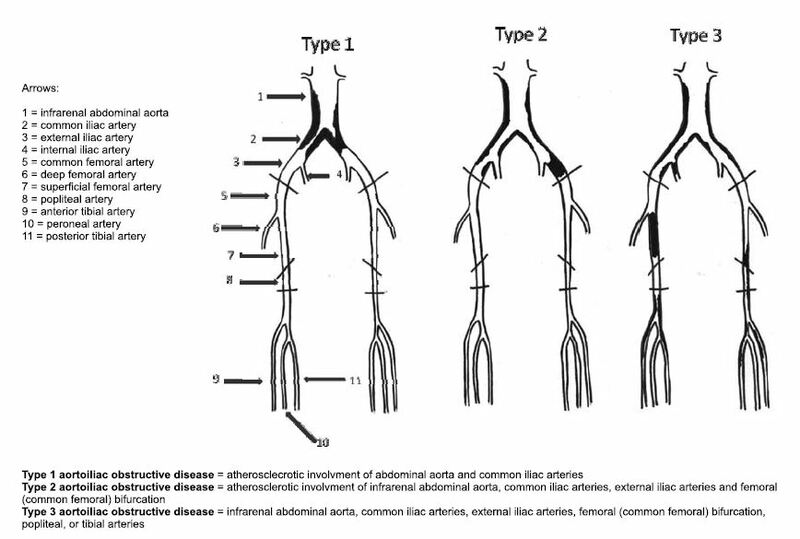 Aortoiliac obstructive disease is also divided in three forms of disease (Figure 1). Figure 1. 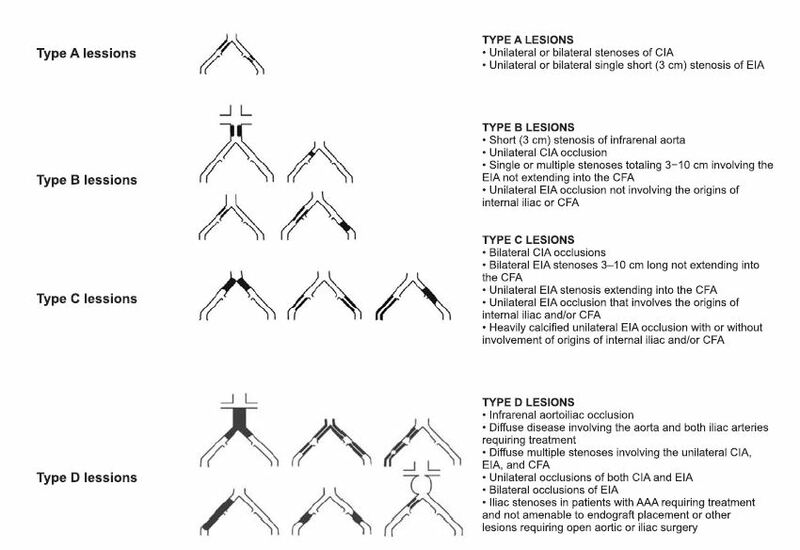 Aorotoiliac obstructive disease classification, from (1). Figure 2. The Inter-Society Consensus for the Management of Peripheral Arterial Disease (TASC II) classification of aortoiliac lesions (1). Figure 3. The Inter-Society Consensus for the Management of Peripheral Arterial Disease (TASC II) classification of infrainguinal obstructive disease (1). *Abbreviations: CFA = common femoral artery; SFA = superficial femoral artery. Along with the arterial bypass we also perform (thromb)embolectomies, (thromb) endarterectomies, angioplasties, depending on arterial lesions found and eventual thromboembolic complications (Figures 5-8,14). Figure 5. 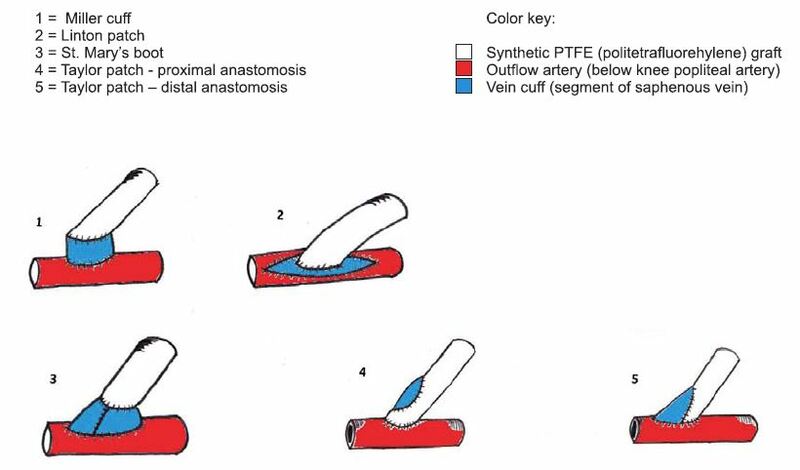 Basic techniques in vascular surgery (18). Figure 6. Patch angioplasty (18). A. Definition: Bypass is a shunt that goes round on an occluded artery, performed in a terminolateral (end-to-side) manner proximally and distally (in order to preserve collateral circulation), which provides blood flow to the vascular bed distally of occlusion. In the case of anatomic bypasses the shunt is parallel with the occluded vessel. Arterial bypass assumes the existence of terms such as „inflow (run in)”, the vascular conduct and „outflow (run off)”. Inflow is represented by the donor artery, by the debit and the hemodinamic quality of the blood flow which alimentates the bypass. The conduct is the connection element between the inflow and outflow. It can be manufactured of different materials, biologic or sinthetic, and it can or cannot follow the traject of occluded artery (anatomic or extraanatomic bypass). 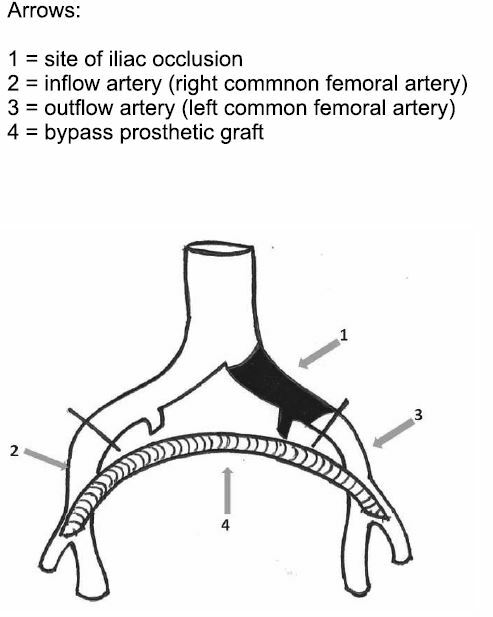 Outflow is represented by the distal vascular bed alimented by the bypass (2) (Figure 4). B. History: In 1896, Jaboulay made first exerimental succesful repair of a carotid lesion by eversed suture. Between 1904 – 1906 Carrel si Guthrie, in Chicago, develop numerous progress in suture and vascular anastomosis technique vasculare, during the first attempts of organ transplantation: triangulation technique in vascular anastomoses; first interpositions of inverted venous segments in arterial circulation with demonstration that they do not degenerate in high pressure conditions; the Carrel patch. In 1913, Jeger proposes the principle of arterial bypass as treatment of peripheral aneurismal disease (20). In 1948, Kunlin performs first arterial bypass for atherosclerotic obstructive disease. In the history of arterial bypass surgery, at most importance has the evolution of grafts materials. In 1906, Goyanes performs first autologous vein transplant in human. In 1948 Gross uses arterial human allo grafts. Vorhees uses the first sinthetic fabricated grafs, Vinyon N (polivynil chloride) in 1952. Edwards uses politetrafluorethilene (Teflon) grafts in 1957, DeBakey uses poliesther (Dacron) graft s in 1957, Soyer uses expanded polytetrafluorethilene (ePTFE) grafts in 1972 and Parodi starts the use of vascular endografts (covered stents) in 1991 (2). C. Indications: Indication for surgical revascularization is to be made in final clinical stages of peripheral arterial obstructive disease, in vascular trauma and in peripheral aneurismal disease. End stages of obstructive arterial disease correspond to the clinical term of critical ischemia. This includes patients with rest pain, those with trophic lesions (arterial ulcers, necrosis, gangrene), but it also includes patients with incapacitating claudication (intermittent claudication at distances of less than 50 meters) (2). Figure 7. 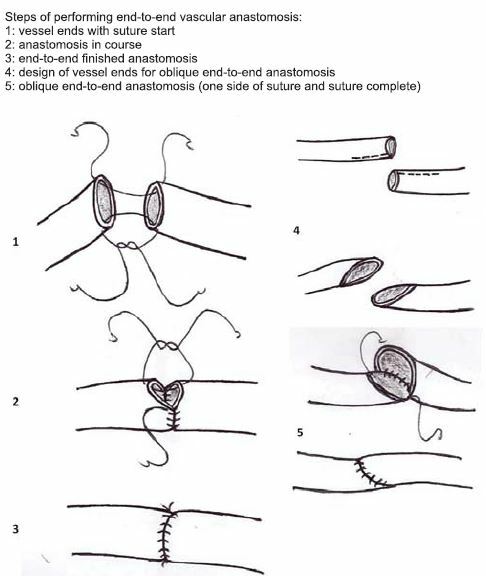 Basic techniques in vascular surgery: end-to-end vascular anastomosis (18). Figure 8. 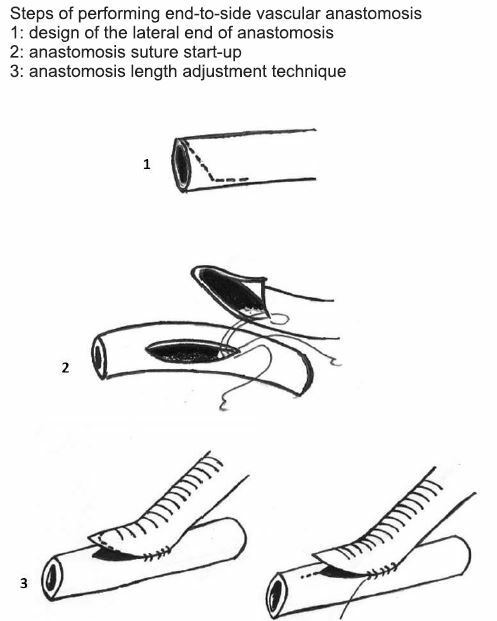 Basic techniques in vascular surgery – end-to-side vascular anastomosis (18). Morphopatologically, surgical treatment indication is made following the classification of the The InterSociety Consensus for the Management of Peripheral Arterial Disease (TASC II). Type C and D lesions of this classification in both aortoiliac and infrainguinal localisation, have surgical revascularisation indication. 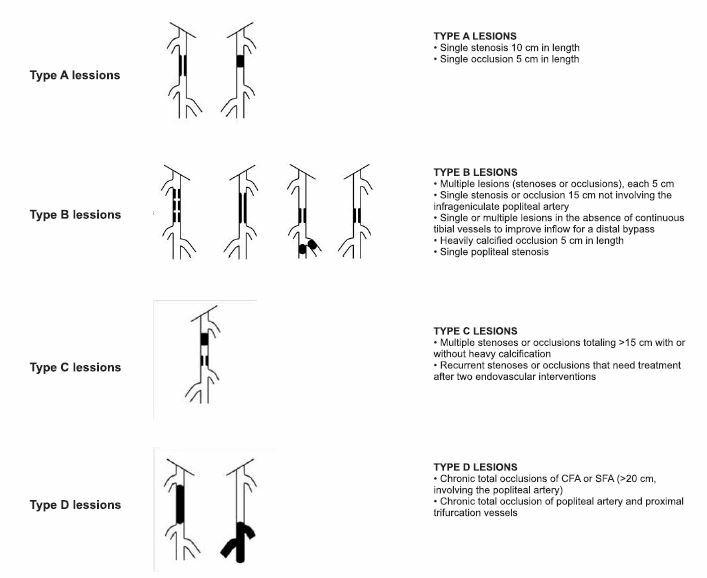 In contrast, type A and B lessions have endovascular treatment indication1 (Figures 2, 3). Contraindications of surgical revascularisation are re presented by general surgical contraindications, as well as very short life expectancy (2). 1. 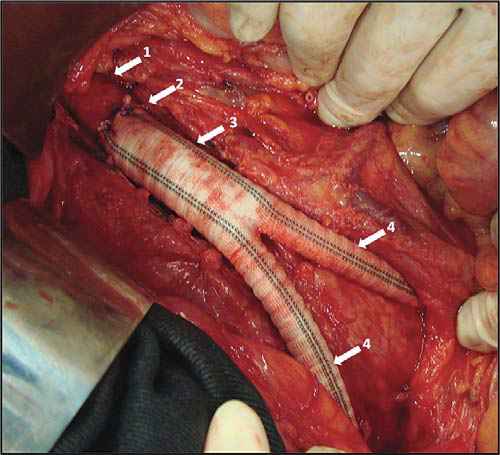 Anatomical criteria: i. Anatomic bypasses: the bypass conduct follows a traject parallel with the occluded vessel. In aortoiliac obstructive disease there can be made aortobifemoral, iliofemoral anatomical bypasses. In infrainguinal obstructive diease there can be performed femuropopliteal (above or below knee) bypasses, popliteopopliteal bypasses or even infrapopliteal bypasses in distal forms of the disease, with involvment of calf arteries (2) (Figures 9, 16- 19). ii. 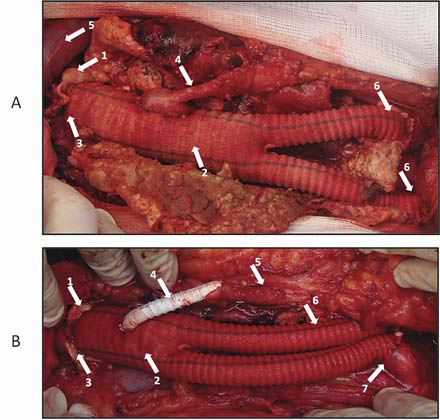 Extraanatomical bypasses: the bypass conduct does not follow the traject of occluded artery. Indications for extraanatomical bypass include: those cases at high risk for more complex surgical interventions of anatomic reconstruction (e.g. aortobifemoral bypass) and which have vascular lessions that cannot be solved by endovascular means; active abdominal septic process, surgically hostile abdomen (13,14). Most used extraanatomical bypasses in aortoiliac obstructive disease are axilofemoral, axilobifemoral and femurofemoral bypasses. 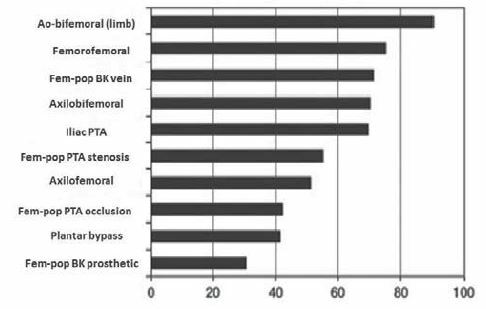 There are described other types of extraanatomical bypasses, such as transobturatory iliofemoral bypass, indicated in cases with groin infection (15-17) (Figures 10, 11). 2. Type of bypass graft: Nowadays there is a large variety of vascular graft available. 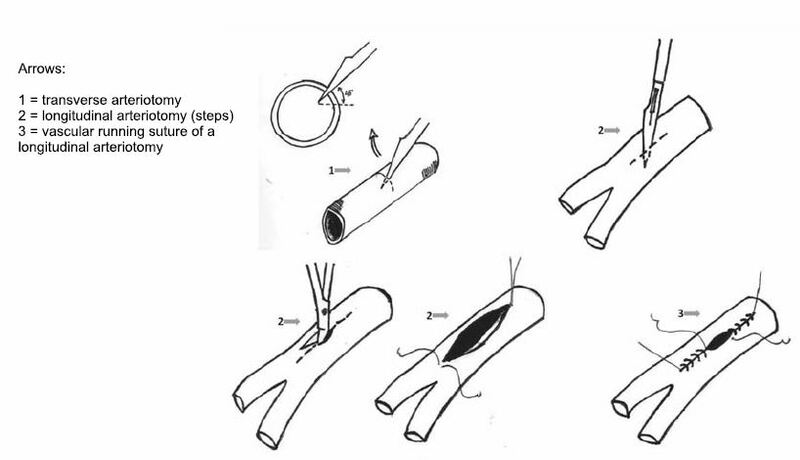 The characteristics of ideal vascular graft are: it must be available in a large variety of dimensions and shapes; high durability; lack of reactivity (toxicity or allergenicity); good elastic properties, easy maneuverability; malleability and folding capacity; inner lining atraumatic for blood cells and nonthrombogenic; infection resistance; low cost; easily purchasable; unlimited resterilization capacity. Figure 9. Anatomic aortobifemoral bypass (19). Figure 10. 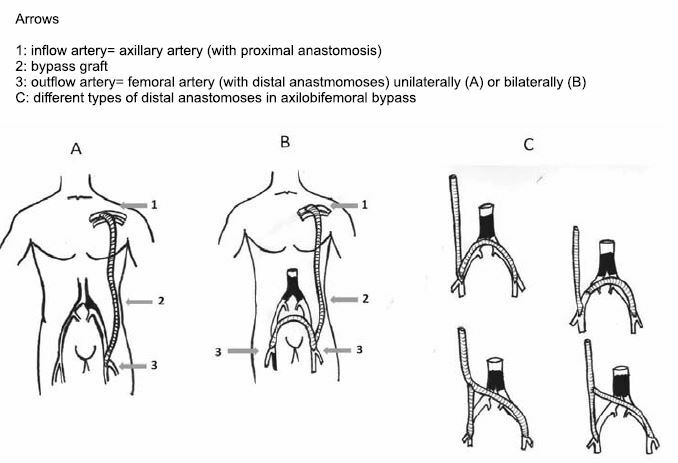 Extraanatomic axilo(bi)femoral bypass (2). 1. Arterial allograft (or homograft). It assumes transplantation of a biological material from one individual to another of the same species. 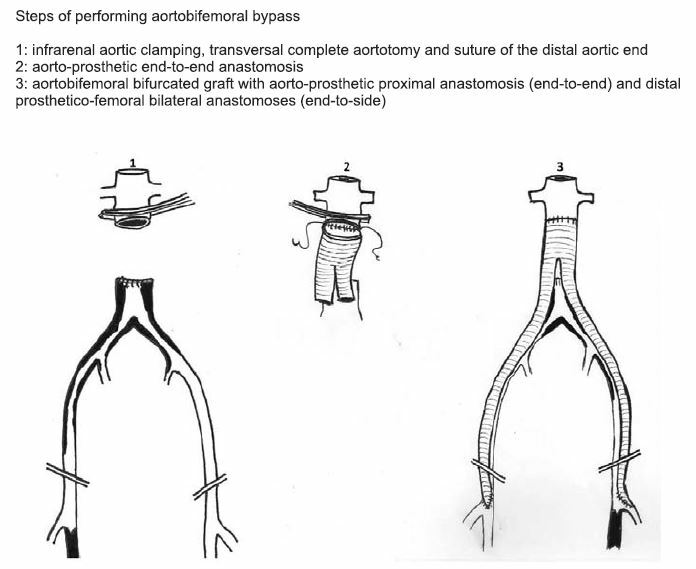 Indication of arterial allo grafts usage exare: renal revascularization in renal fibrodisplasia; surgical treatment of peripheral arterial aneurisms, vascular trauma, arterial reconstructions aft er infected synthetic vascellent cular graft removal, mycotic aneurisms (2) (Figure 21). Figure 11. 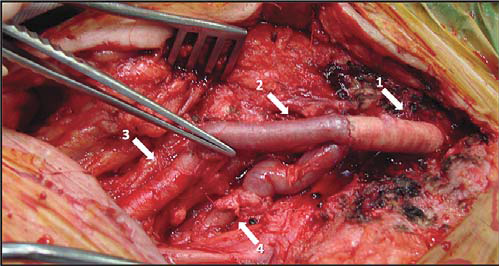 Extraanatomic femorofemoral bypass (4). 2. 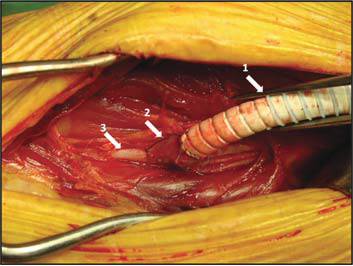 Humbilical vein allograft – may be used as an alternative to synthetic grafts in below knee revascularization (2). 3. Bovine heterograft s (a type of xenograft): present the advantage of a biological material, but also the great disadvantage of high immunogenicity. They can only be used enzymatically treated or tanned. Bioengineered shell may be the solution for reducing their immunogenicity (2). 4. Venous autograft is at most times represented by the great saphenous vein. It can be harvested and used in reversed manner or it may be used in non-reversed manner (“insitu”), after devalvulation. In cases when great saphenous vein is not available or cannot be used as bypass graft , there may be used other autologous veins such as: small saphenous vein, superficial femoral vein, as well as upper limb veins (cephalic or basilic veins). Great saphenous vein graft is the best choice in infrainguinal arterial reconstructions, especially in bellow knee bypasses with an excellent patency (75-80% 5 year patency) (1,6,8) (Figure 20). Figure 12. Several types of distal “vein cuff ”. Synthetic grafts. Nowadays there is a very large variety of synthetic grafts available. For example: textile grafts – the most representative and frequently used being polyester (Dacron) woven or knitted grafts. They may be biologically coated (Collagen, Albumin, Gelatin, Heparin), impregnated with antibiotic substances (Rifampicin) or with Silver ions (antibacterial role). Woven textile vascular grafts have following properties: low porosity and elasticity, they have tendency to unravel at their ends; they have lower tissue integration and a lower anchorage of neointima. 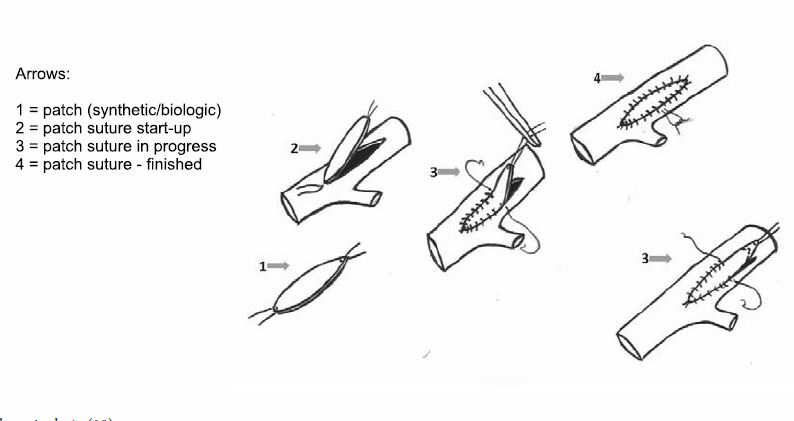 On the other hand, knitted textile vascular graft offer a higher elasticity and porosity, resulting in a better maneuverability, they have superior mechanical compliance, they do not unravel and have superior healing (2,7) (Figure 15). Figure 13. 5 year % patency in main vascular interventional procedures (1). Abbreviations: Fem-pop = femoropopliteal; BK = below knee; PTA = Percutaneous Transluminal Angioplasty. Figure 14. Sinthetic polytetrafl uorethylene patch angioplasty (arrow). 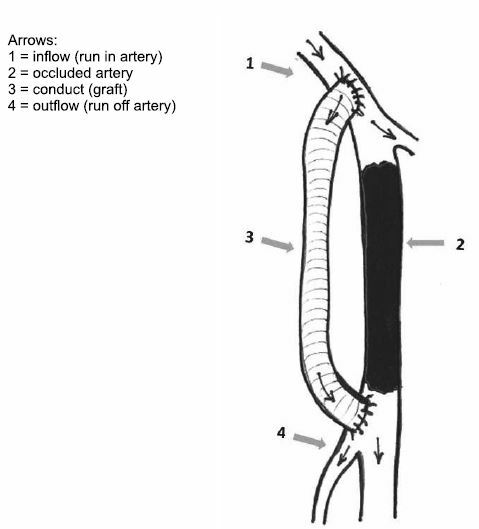 Venous patch angioplasty (arrow). Of nontextile grafts the most widely spread are: Teflon (expanded polytetrafl uorethilene) grafts, Polyurethane graft s, and bioabsorbable grafts. Nontextile synthetic grafts (e.g. : expanded poly tetrafluorethilene) are hydrophobic; have a decreased integration in surrounding tissues; the endothelisation process is only present at anastomoses and they have low resistance (2). Figure 17. Aorto-bifemoral Dacron graft. Figure 18. Aorto-biiliac Dacron graft. Figure 19. Aorto-bifemoral Dacron graft . Figure 20. 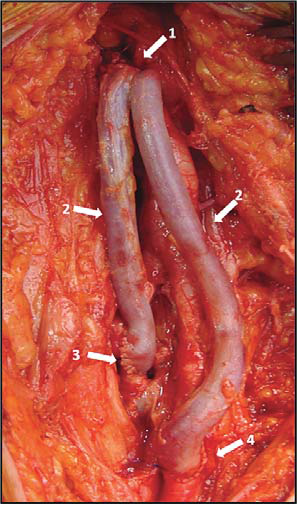 Reversed internal saphenous vein graft s in right femoral region. Composite grafts are those grafts made out of more materials (especially out of a combination of synthetic and biologic grafts). Biological behavior of synthetic vascular grafts is marked by: outer fi brin deposit, multiplication of endothelial cells on the inner surface, but without realisation of a proper endothelial layer with its own known properties, outer invasion of connective tissue elements, and solidarisation of the fi brin layer. Figure 21. Reconstruction of femoral bifurcation with venous homograft . Figure 22. St. Mary’s boot vein cuff. Figure 23. Graft infection in femoral region. In order to achieve thrombosis resistance, and infection protection, there have been targeted the following: endothelial cell seeding, colloidal graphite lining, antibiotic impregnation, increasing the compliance (2). 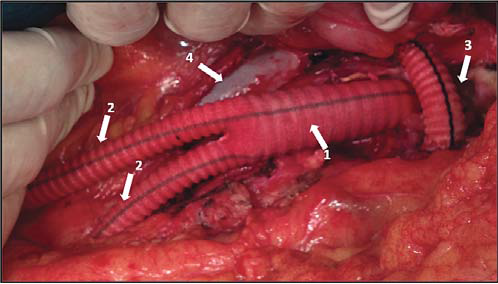 In case of aortoiliac reconstruction the bypass graft of ellection is synthetic polyesther woven or knitted (Dacron) or expanded polytetrafluorethilene as aortic graft s. In case of infrainguinal reconstructions there may be used: venous autografts, synthetic grafts (expanded polytetrafl uorethilene, Dacron); human umbilical vein allograft , or composite grafts. For infrainguninal localization of arterial obstructive disease, especially in infrageniculate reconstructions, venous saphenous autograft is of election. (Excellent patency, similar with those of above knee bypasses, in comparison with infrageniculate synthetic graft bypasses). 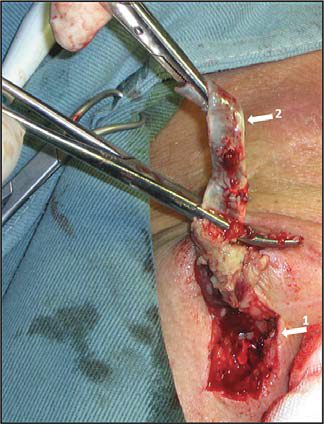 In cases of below knee bypasses with synthetic grafts, there may be used technical procedures in distal anastomosis that improve graft velocity and patency. They are generically called vein cuffs and they are of several types: Miller cuff , Linton patch, St. Mary’s boot, Taylor patch (4,5, 21,22) (Figure 12, 22). Indirect complications: false aneurism, graft infection, distal embolization, fistulas or erosions in near organs2 (Figure 23). Precocious graft occlusion have the following etiologic causes: distal intimal flap; kinking or twisting of the graft ; incomplete thrombus evacuation; unexpected hypercoagulation, severe outfl ow disease (23-25). Late graft occlusion (2 year) etiology constitutes of progressive atherosclerosis or anastomotic false aneurism (9,10,11). – technical errors: restant or scarred venous valvulae; graft tunneling errors (graft entrapment); injured vein segments; sclerous veins; run-off artery thrombosis; thrombocite agregation; anastomotic stricture; intimal flap. – postoperatory lessions: miointimal hyperplasia, aterosclerosis progresion, aneurismal degeneration (2)). Postoperative treatment in patients outgoing arterial bypass surgery consists of: platelet aggregation inhibition (aspirine or clopidogrel – especially in cases with endarterectomy or balloon or stent angioplasties asociated); cilostasol is an phosphodiesterase III inhibitory agent which also have platelet aggregation inhibitory action and antiprolipherative effect on smooth muscle cell; the anticoagulant treatment (is selective); statins (which have a role in atherosclerotic plaque stabilisation); high blood pressure control (1,3). In postoperative follow up after peripheral arterial surgical revascularization, are used objective endpoints such as patency, limb salvage, survival rate, but also subjective end-points (quality of life) (2,12). Primary patency describes a functional bypass without further interventions on the conduct or anastomoses (there are not included interventions proximally or distally of the bypass) (2); Primary assisted patency describes a bypass which has necesitated an intervention (surgical or endovascular) in order to mentaining patency, but it was never fully thrombosed (2); Secondary patency describes a thrombosed bypass successfully thrombectomised (2) (Figure 13). Our department experience: In a period of time of 17 months (between January 2014 to May 2015), we have had treated and operated in our department 375 patients with peripheral obstructive arterial disease. Of these patients, 131 were amputated per primam (major amputation) and 244 were surgically revascularized. There were performed 126 surgical revascularization interventions for aortoiliac obstructive disease and 118 interventions for infrainguinal obstructive disease. We have had a combined (aortoiliac and infrainguinal) total rate of major amputation of 16,8% after surgical revascularization, with no perioperative deaths in chronic patients. After emergency revascularization we have had a mortality rate of 8,1% for aortoiliac localisation and of 1,8% for infrainguinal localisation. Arterial bypass is a classic, yet a very efficient surgical method of treatment for peripheral arterial obstructive disease in critical ischemia patients, with good results on limb salvage, on improvement of quality of life and on survival rate in this category of patients. A very careful assessment of vascular patients perioperatively and good surgical strategy and technique lead to good patency in time for this procedure. These end-points are also found in our department’s experience, measured by low postoperative mortality and amputation rate, which subdue to results published in literature. 1. Norgren L, Hiatt WR, Dormandy JA, Nehler MR, Harris KA, Fowkes FGR. Inter- Society Consensus for the Management of Peripheral Arterial Disease (TASC II). J Vasc Surg 2007;45:S5–S67. 2. J.L. Cronenwett, K.W. Johnston. Rutherford’s vascular surgery. 7th ed. Saunders Elsevier, Philadelphia, PA; 2010. 4. David Paul Slovut, Evan C. Lipsitz. Surgical Technique and Peripheral Artery Disease. Circulation. 2012;126:1127-1138. 4. Nowygrod R, Egorova N, Greco G, Anderson P, Gelijns A, Moskowitz A, McKinsey J, Morrissey N, Kent KC. Trends, complications, and mortality in peripheral vascular surgery. J Vasc Surg. 2006;43:205–216. 5. Neville RF, Tempesta B, Sidawy AN. 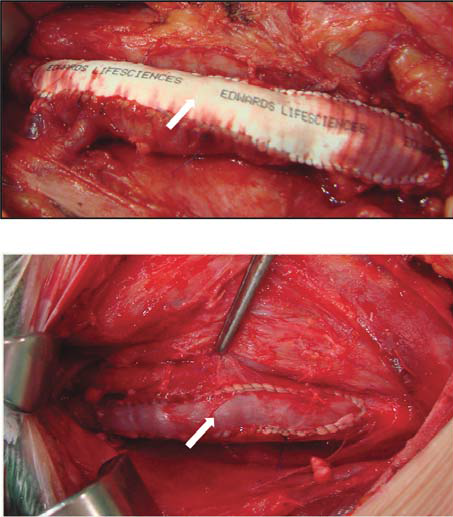 Tibial bypass for limb salvage using polytetrafl uoroethylene and a distal vein patch. J Vasc Surg 2001; 33:266-271. 6. Wengerter KR, Veith FJ, et al. Prospective randomized multicenter comparison of in situ and reversed vein infrapopliteal bypasses. J Vasc Surg 1991;12:189. 7. Veith FJ, Gupta SK, et al. Alternative approaches to the deep femoral, the popliteal and infrapopliteal arteries in the leg and foot. In: JJ Bergan, JST Yao, eds. Techniques in arterial surgery. Philadelphia: WB Saunders, 1990:145–156. 8. Veith FJ, Gupta SK, et al. 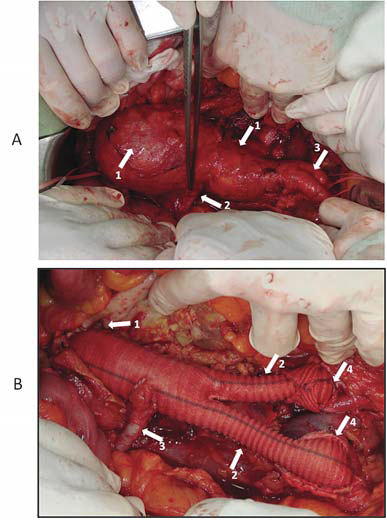 Improved strategies for secondary operations on infrainguinal arteries. Ann Vasc Surg 1990;4:85. 9. Goodney PP, Beck AW, Nagle J, Welch HG, Zwolak RM. National trends in lower extremity bypass surgery, endovascular interventions, and major amputations. J Vasc Surg. 2009; 50: 54– 60. 10. Nowygrod R, Egorova N, Greco G, Anderson P, Gelijns A, Moskowitz A, McKinsey J, Morrissey N, Kent KC. Trends, complications, and mortality in peripheral vascular surgery. J Vasc Surg. 2006; 43: 205- 216. 11. Flu HC, Ploeg AJ, Marang-vande Mheen PJ, Veen EJ, Lange CP, Breslau PJ, Roukema JA, Hamming JF, Lardenoye JW. Patient and procedure- related risk factors for adverse events aft er infrainguinal bypass. J Vasc Surg. 2010;51:622-627. 12. Taylor SM, Kalbaugh CA, Blackhurst DW, Cass AL, Trent EA, Langan EM 3rd, Youkey JR. Determinants of functional outcome aft er revascularization for critical limb ischemia: an analysis of 1000 consecutive vascular interventions. J Vasc Surg. 2006;44:747-755; discussion 755- 746. 13. Chiu KW, Davies RS, Nightingale PG, Bradbury AW, Adam DJ. Review of direct anatomical open surgical management of atherosclerotic aorto-iliac occlusive disease. Eur J Vasc Endovasc Surg. 2010;39: 460- 471. 14. Ricco JB, Probst H. Long-term results of a multicenter randomized study on direct versus crossover bypass for unilateral iliac artery occlusive disease. J Vasc Surg. 2008;47:45-53. 15. Johnson WC, Lee KK. Comparative evaluation of externally supported Dacron and polytetrafl uoroethylene prosthetic bypasses for femoro-femoral and axillofemoral arterial reconstructions: Veterans Affairs Cooperative Study #141. J Vasc Surg. 1999;30:1077-1083. 16. Kim YW, Lee JH, Kim HG, Huh S. Factors aff ecting the long-term patency of crossover femorofemoral bypass graft . Eur J Vasc Endovasc Surg. 2005;30:376-380. 17. Th uijls G, van Laake LW, Lemson MS, Kitslaar PJ. Usefulness and applicability of femorofemoral crossover bypass graft ing. Ann Vasc Surg. 2008;22:663-667. 18. Robert. B. Rutherford. Atlas of Vascular Surgery. Basic techniques and exposures. Ed. Saunders Elsevier, Philadelphia, 1993. 20. Robert M. Sade. Transplantation at 100 Years: Alexis Carrel, Pioneer Surgeon. Ann Th orac. Surg. 2005;80:2415. 21. Emil Viciu, Eduard Apetrei. Arteriopatiile periferice. București. 1979 22. Carmen Ginghina. Bolile arterelor periferice. În: Mic tratat de cardiologie. Ed. Academiei Române, 2010, 773-787. 23. Croitoru M, Revascularizatia interventionala in arteriopatiile periferice in Tratat de cardiologie, Eds Costin Carp, Ed Medicala Nationala 2003, Volum 2,pg 961-966. 24. Lucian Predescu, Marin Postu, Pavel Platon, Mihaela Rugina, Madalina Gavanescu, Marian Croitoru, Adrian Bucsa, Lucian Zarma, Dan Deleanu. Complication of a diagnostic peripheral arteriography. Rom Journal of Cardiology. 2014;24: 297-299. 25. Marius Rac-Albu, Mihaela Sălăgean, Mădălina Găvănescu, Isabella Oprea, Marian Croitoru. Ankle-brachial index aft er aortofemoral bypass. Rom Journal of Cardiology. 2014;24: 41-46.